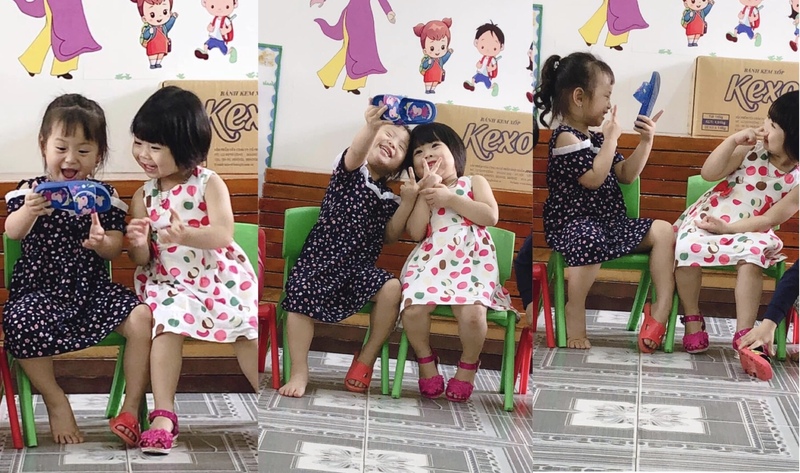 A selfie session showing imagination and innocence. Facebook user Minh Phương uploaded a video on April 3 (Wednesday) of two adorable girls using a Peppa Pig slipper as a phone and taking selfies with it. Ten days later, the video has over 11 million views and 233,000 shares. The video began with the girl in a dotted navy-blue dress swiping away on the slipper, like a certified auntie. Her companion, the little girl in a pink and white polka dotted dress, looked on and gave some comments. The “tiny auntie” pulled her phone away and continued swiping (probably looking for the camera app). Finally, she found it and told her friend. She flipped the phone and proceeded to take a selfie with her seatmate; phone angled perfectly. Their ear-to-ear smiles were priceless. A few snaps with peace signs were also taken. Selfie tradition entails checking the photo’s quality after it’s taken, which the girls did when the phone was lowered. The girl in the blue dress pointed to their picture and commented while her seatmate listened. Probably not satisfied with the outcome of the pictures, the one holding the phone tried to take some more, but her friend wasn’t aware. She grabbed her arm, alerting her of the camera ready to take better photos. When her friend saw the slipper phone, she was quick to give her best smile and went on to a pose with her tongue sticking out. Once again, they checked the quality. The girl in the polka dotted dress probably wanted a solo pic, so her friend flipped the phone into portrait mode and took some. 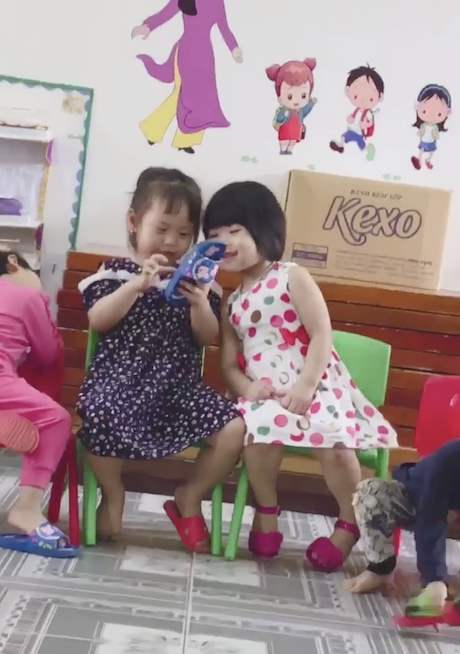 As for the suspected owner of the phone slipper, the kid sat unaware beside the little girls. Ms Minh Phương included in the caption how the girls quickly placed the phone down when the teacher called out their attention. 2 cô gái mải mê chụp hình lúc đầu là cam trước để seo phi sau thì xoay cam sau để chụp hình cho bạn khi cô giáo gọi thì vội bỏ smartphone xuống chân để “dạ cô” ??? ?Cuối clip smartphone lại về với thân phận chiếc dép có hình heo peppa ??????????????? ?